The first metal song to get to number one, which more than anything else tips you off as to what a strange, broad, inclusive-despite-itself church metal is. And yes, this surely qualifies. 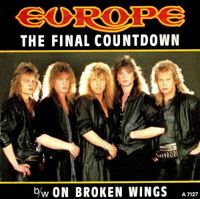 “The Final Countdown” puts its fanfare riff atop a gallop of power hair and Valkyrie guitars and the result is impeccably pop – so much so it split the band! – but their roots were heavier, trading personnel with Yngwie Malmsteen, paid-up members in good standing of the Swedish Metal Scene. For those of you who bristle at the prospect of Bis week, let’s break you in gently with a band that isn’t Bis at all (but is in the blessed business of Bis). data Panik formed from the sherbet ashes of Bis in 2005, only releasing two singles before rematerialising phoenix-style into two-dimensional animated versions of their original sugary selves. Short and sweet! And just what did the Internet look like when Bis’ major label debut Tell It To the Kids came out? In this post I present to you another piece of unearthed arcana, now that the BBC’s never-lamented “Gateway to the Stars” is no more. It’s the BBC’s Politics ’97! Complete with Diana tribute! Poise yourself carefully between an outpouring of national grief and the latest in animated gif technology! Imagine a Labour Party that hadn’t lied about Iraq! See if any links aren’t broken!